We had another baby shower at our house today. I must say our house is a good party place. This shower was for my sister-in-law. She and my brother are having their first baby next month. It's a boy. This sister-in-law really likes my sewing so I just had to make her something. 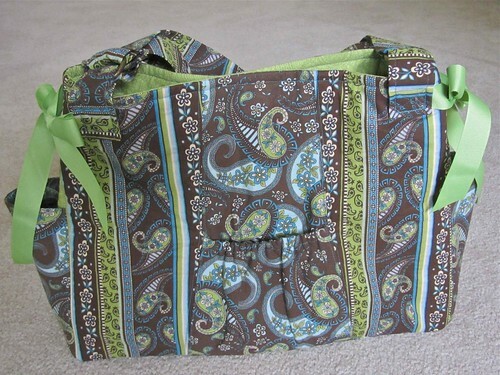 I decided on a diaper bag, a changing pad, and a nursing cover. Somehow I didn't have enough time and I only got the diaper bag done. Three bags in three weeks is a lot for me along with the craziness of normal life. I gave her an IOU for the other two things. They won't take too long and I should have them to her before the baby comes. She was understanding. Here's L. opening her gift. She loved it, of course. While the shower was going Meg and Kade both had a game at two different parks. That meant Mickey was running around a bit. His parents attended Meg's game and then they all had a late lunch together. Mat stayed for the shower and got to be chatty with everyone and pass the gifts to her aunt. That is the classiest diaper bag I have EVER seen! Wow!